I went on a search for the best reusable drinking straws for kids as I attempted to transition my children from their sippy cups to regular glassware. It took awhile to remove the cups permanently from our home. It happened when I finally broke the habit of giving the cups to them. They are mostly spill-proof and so convenient after all. My kids broke the habit of needing them to drink from. After years of use, they were part of their routine. With much internal fanfare, I threw them all in the recycle bin. After using those plastics for 6+ years, I was so excited to never see another one in my house again. This was a huge accomplishment! Then I began my quest for the best straws for kids. I didn’t think transitioning to an actual glass would be so difficult. I was nervous about spills on our carpet as we often have drinks in our living room. However, I was excited about putting the glasses in the dishwasher, guilt-free, unlike with plastic. My kids weren’t very happy about the change until I put straws in their glasses. I remember that one of the advantages of sippy cups was that less fluid remained on the kids’ teeth. I had once read that straws did the same thing. And it would make it fun for them as they transitioned to glass too. Best silicone straws are here. My sister had given us a beautiful box of paper Halloween straws that I found in my pantry. They are thicker-than-paper straws and come in really fun colors. I like that they are biodegradable and so festive. For a low cost, they would really dress up a party. It would be convenient and cool to put them in a straw decanter on the kitchen counter and change the colors out with the seasons as desired, especially since I rarely have holiday decorations in my kitchen. And giving the kids different straws each day would be lots of fun for them. I really thought these could be the best straws for kids. The problem for us, while the paper straws are so cute, if my kids didn’t drink their drinks in a timely manner, the paper straws would start to come apart. I started to only use them for small drinks at meals, not when I leave out their “between-meal” drinks. I now buy them for parties and may use them when friends come over but not for our everyday drinking straws. Also, I started feeling guilty as this is a lot of unnecessary waste in our landfills, even if they are made of paper. The great news though is the kind of paper straws we tried are biodegradable and made with safe food dyes. They are definitely worth a try; however, in an effort to use less consumables, we don’t buy them. By now my kids were mostly transitioned to glassware and were really enjoying using straws. I am embarrassed to admit, the second kid-friendly straws we tried were those inexpensive, plastic straws. The very thing I am trying to stop using. But they are so cheap (100 for $1!) and easy and disposable, and my kids just love these straws. One of the problems was that I found myself giving them a new straw for each drink because they were inexpensive. I thought, “They are so cheap. 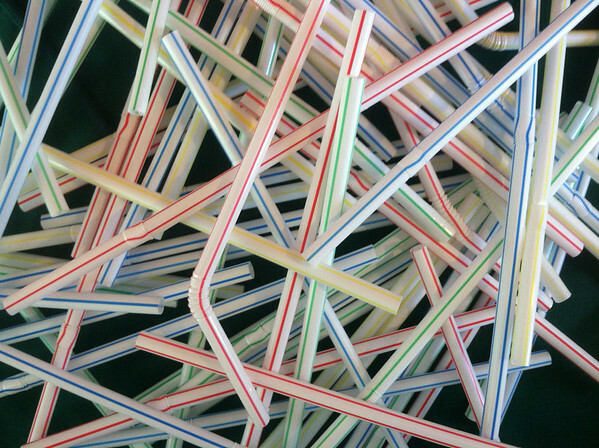 When I realized this could be 5-8 straws a day, per child, I felt sick about filling up our landfills unnecessarily and contributing to demand. I started giving each child a certain color for the day and rinsing them off to reuse them for that day. After a few days of this, it still wasn’t sitting right with me. These are made of plastic, the very material I am trying to get away from. I am having my children put these straws in their mouths. And, they are made from plastic made in China! We used the rest of the straws for crafts, and I never bought another disposable plastic straw again. Update: Years later, and I still haven’t bought these straws. Not only that, when we go to restaurants, I try to remember to bring our reusable straws from home. The straws I bought were a tie-dye pattern, and my kids enjoyed mixing the tops and bottoms. They are also available in blue/green and pink/green. We lost one of the tops — how, I do not know — but still were able to use the one piece. 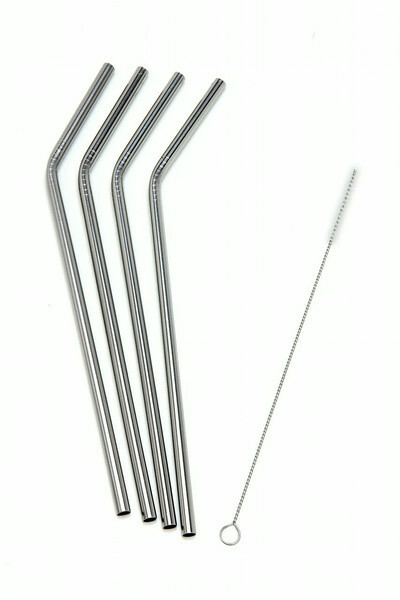 Because these reusable drinking straws come apart, they are easy to clean. They are dishwasher-safe, however, I did not do so as I was afraid the silicone would break down. Like all reusable drinking straws, you should rinse them out immediately after use, especially after drinking a thicker drink. Use a straw washing brush to prevent mold buildup. These straws are wide enough for smoothies. I kept them upright in separate pieces in a drinking glass to facilitate drying. 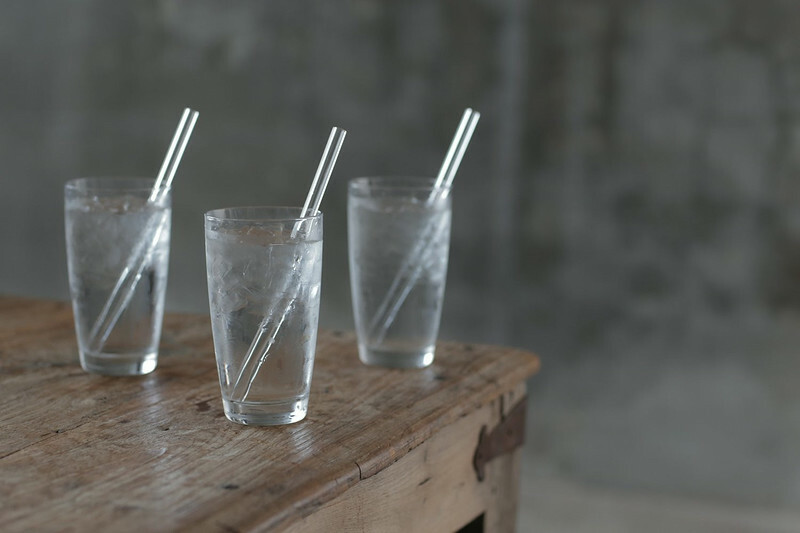 Do not put these straws — or any reusable straws — away wet. You really do not want mold growing in your straws. You must clean them out – don’t just run them under water or put them in the dishwasher. Use a straw cleaner or a pipe cleaner or something, or you will have mold growing. If you clean these straws properly from the start, I would highly recommend using them. While the Hummingbird Glass Reusable Drinking Straws option seemed to be the best, safest choice from a health vantage, I was just too worried about the kids breaking them, biting them, or banging their teeth with them, so at first I didn’t buy them. But then I did, and I like them a lot. I have let my kids use them but only while seated at the table, when they aren’t messing around. I think they are the best overall option, just not the best reusable drinking straws for kids because of the safety issue. However, there are a lot of positives: You don’t have to worry about toxins leaching into your system. They are usually wider than typical plastic straws which makes it easier to drink thick smoothies, etc. from. I love that these straws are made from glass and not plastic and that they are made in the United States. They are also a lot easier to clean as I can see through them. I further researched reusable drinking straws and remembered that years ago, pre-kids, I purchased some stainless steel reusable drinking straws. Who knows where they ended up? Easily, I found some nice ones online Epica Stainless Steel Drinking Straws, Set of 4 Free Cleaning Brush Included and ordered them. 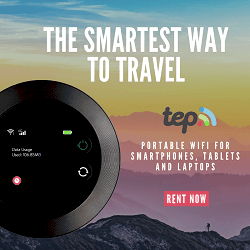 I was very excited about this option because they would be excellent for the environment as they were a one-time purchase, thereby saving me money. And the ones I found online (link above) are made from food-safe, 18/10 stainless steel and shouldn’t rust or break. They also came with a cleaning brush, which is essential when you are reusing straws. My kids enjoyed these fun straws right away. They liked that the straw became cold too. Depending on your drink, if you add ice cubes or are drinking a frozen drink, you may or may not enjoy this. I really liked that the stainless steel reusable drinking straws came with a brush to clean them. After my experience with the silicone reusable drinking straws, I would highly recommend you frequently brush the straws out in addition to running them in the dishwasher. I like being able to put these stainless steel straws into the dishwasher guilt-free. It’s great to not worry about toxins seeping out after multiple dishwasher runs. I was worried about a metallic taste but my husband and I notice one. The ones we have are not really wide enough for smoothies but you could probably find some larger ones on Amazon.com. Kids must be mindful while using them so they don’t bump their teeth. This is not a problem if your kids stay seated while drinking but if your kids carry their drinks around while playing you would not want them to use these straws. We use the stainless steel straws for when they are sitting and drinking at the table only. Pros for stainless steel reusable drinking straws: reusable; easy to clean with brush and dishwasher; durable; not plastic; non-porous, safe material to drink from; one-time purchase will save money, no BPA, phthalates, stainless steel won’t rust, scratch, chip or break! I like that the one from Epica comes with a cleaning brush as well. 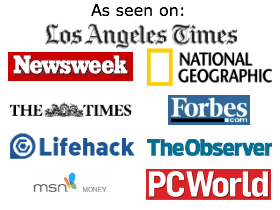 Bamboo straws are another excellent option as they are made from a renewable source. And you can reuse them. Bamboo straws are washable and sustainable and made from a natural material. They are great straws for kids. Be sure to wash them well after each use and to let them dry out completely before storing them. For our family, bamboo straws are the best straws for kids. Pros of bamboo straws: made with renewable, eco-friendly material, non-toxic, shouldn’t break; unique gift idea; each one should be a little bit different; you can put certain brands in the dishwasher; shouldn’t hurt child’s teeth if straws hits tooth. These might be the best straws for kids! We love products made with sustainable, renewable bamboo. Really, who knew finding safe reusable drinking straws would be so fun? After spending a few weeks which then lead into months and years once we tried glass and bamboo straws, I am happy to have found the best reusable drinking straws for kids. The eco-friendly bamboo reusable drinking straws have been working for our family and will be the straws we use. We often bring them to restaurants instead of using plastic straws there. Not only are we saving straws, but we are keeping them out of the landfill. 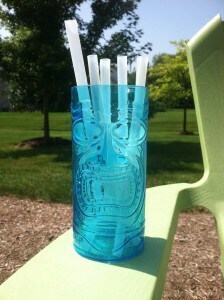 Learn about Yeti vs Ozark Trail tumblers and eliminate the need for disposable cups when you are out. Read our review of Yeti vs Ozark Trail. There is a great lid Yeti sells that works with straws and comes with a straw. It fits the Ozark Trail tumblers too. We don’t use straws all the time but when we do, I feel good about using something safe and reusable that also helps to keep the juice and milk off my children’s teeth. I’m also thrilled we are no longer using plastic straws then throwing them away, which fill up our landfills. We are successfully eliminating the plastic in our kitchen and are happy with these bamboo straws, the best reusable drinking straws for kids.